I started to keep a dog at the end of last year (2015). Hana 2 and 1/2 months old. An adverticement photo on the website of a pet shop. I was immediately charmed by this puppy. It was not an impulsive decision. I always wanted to have a dog, since our favorite young male dog died at our parents' house when I was a student. I really missed him and wanted to have another dog similar to him. But, I could not decide to acquire one, as I needed to move frequently due to my job and live in many different countries. It did not appear easy to take a dog to overseas posts, as I then had to go through severe quarantine formalities and overcome dog-unfriendly environments in certain countries. Therefore, I refrained from keeping a dog while I was working, namely more than four decades. 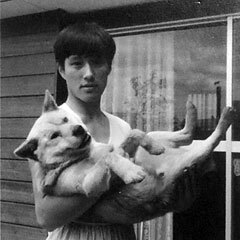 Goro and I long time ago. Now, I am liberated from overseas engagements and I can constantly stay in Tokyo. Therefore, I decided to fulfil my long-cherished dream. However, there were some more difficulties to overcome. The first one was the opposition from my wife as well as my old parents. They unanimously wondered about my readiness to take care of the dog by myself. For example, they questioned whether I could take care of the dog: everyday walks, preparation of meals and obedience training. They treated me as if I were a small boy wanting a dog. Hana 3 and 1/2 months old. A week after her arrival in our house. Another difficulty was where to find a dog. First, I wanted to find one from among the rescued dogs. According to the Ministry for Environment, in total 53,173 dogs arrived in public health centers and among them 14,286 were returned to the previous owners and 17,339 were rehomed, but 21,593 were culled in FY 2014. Though the number of rescued dogs has been steadily declining, the number of culling is still high. Therefore, I wanted to save one of those poor dogs who might otherwise lose their lives. However, I was greatly shocked when I saw some web-sites of the NPOs working for the rescue of pets. They, without exception, denied the transfer of the animals under their protection to senior families which consist of only senior people over 60 years old. I understand their general concern about senior people and their longer-term capability to keep pets. But, Japan boasts of being a country of longest life expectancy in the world. Those NOP leaders certainly believe that their dogs will all live till 30 or 40 years old and outlive their old owners. As a result, I was forced to find a dog at pet shops. 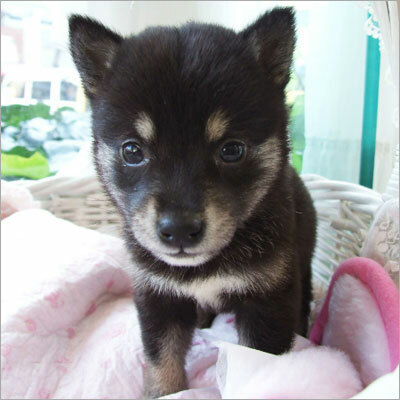 It was at the beginning of December, I was watching the internet site of a pet shop near from our house and came across a very cute photo of a black Shiba-Inu puppy (photo left above). I was instantly charmed by the dog and showed the photo to my wife. To my surprise, in spite of her earlier negative comments about keeping dogs, she did not say anything negative about this little black puppy. We went to the shop next day and quickly bought the puppy, before she was taken away by somebody else. Hana is happier at home. Hana also gives delight to my mom. A typical dog trick. Shake! LOOONG tongue! Hana is badly wanting to go home. She feels she has walked too much today! I wanted to name our new dog after my old dog I mentioned above, namely Goro. Succession of the name of my favorite dog was almost an obsession to me. But, I could not obtain positive support from any member of my family. They all said, Goro is a male name and our new dog is a female. Upon the proposal of my wife, our new dog was named "Hana"; Hana means "flower". My wife explained that a name has magical power on its owner and as the name "Hana" has a very gentle and affectionate mood, its owner will inevitably have such characteristics after having heard her name thousands of times. After six months, Hana has proved to be a very wild and stubborn girl. 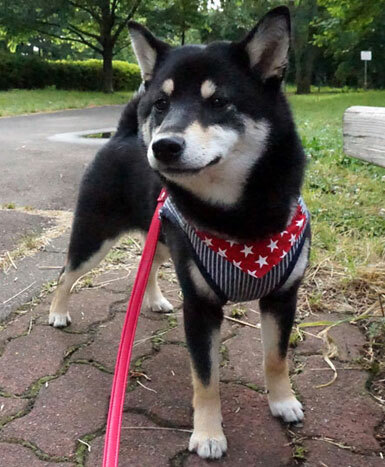 Hana's breed is Shiba-Inu ("Inu" means dog. 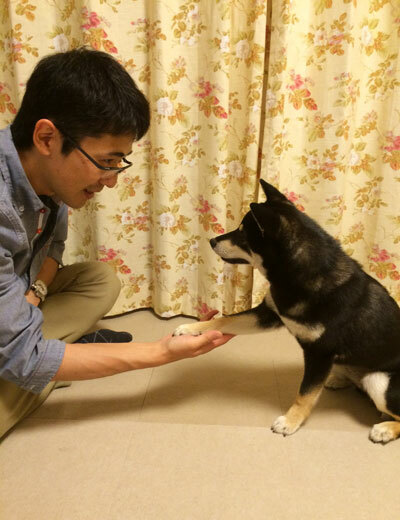 Therefore, just say "Shiba" is enough.). 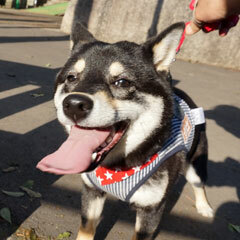 Shiba is the smallest and at the same time the most popular traditional Japanese dog breed. 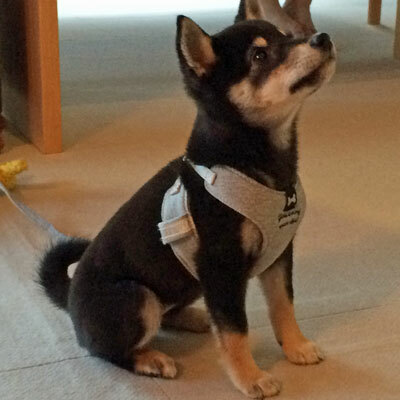 Most of Shiba have short brown coat. 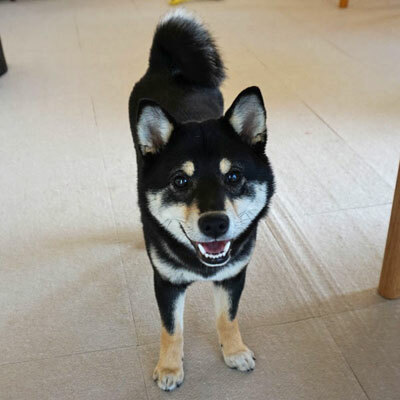 But, 20 % of them, so-called Black Shiba, are tricolor coated, namely black, brown and white, with very characteristic round brown eyebrows on black background. Hana is loved by all members of my family. She is now a strong bond between me and my wife. Nearly 90% of our daily conversation concerns Hana, mostly about her poop and wee-wee. Though she used to tell that I should take the dog for daily walks, now she wants to go out for a walk with Hana every day. Our daughter, who lives 15 minutes' walk from our house, now visits us together with her husband much more often than before to see Hana. Recent shnapshot on her walk in the Zenpukuji-gawa Park. Hana is now 8 months old. My old mom is also very happy to be able to hug a dog again. Certainly she missed Goro much stronger than I, but did not have a courage to keep another dog after having witnessed too early death of her favorite dog. 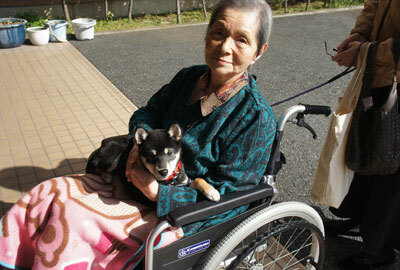 One big reason why I wanted to have a dog, was my wish to see my mother smiling with a dog, because she did not appear happy after having broken her hip bone and being forced to sit on wheel chair. Hana is now a heroin, or princess of my family. I would like to describe her in more details in the next essay. 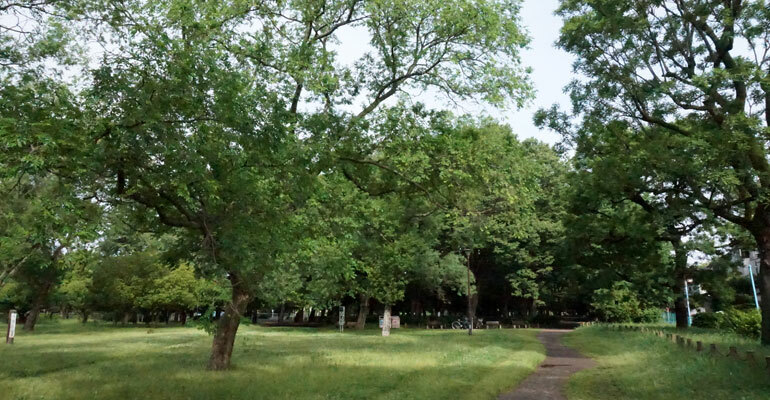 The nearby Zenpukuji-gawa Park offers with its spacious greenery the idel condition for dog walks.